A hotel built c.1930. It was used as an RAF Fighter Command headquarters in 1940-1. 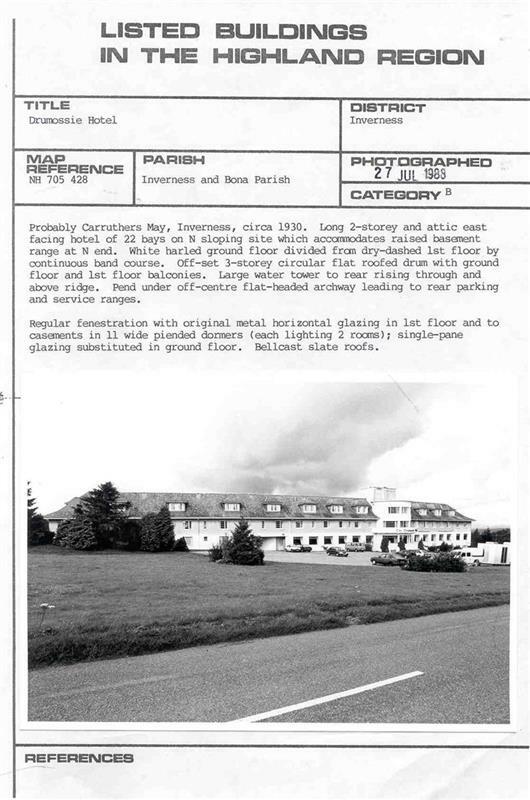 Drumossie Hotel (Image/Photograph(s)/Aerial Photograph). SHG8703. Drumossie Hotel (Image/Photograph(s)/Aerial Photograph). SHG8704. <1> Jenner, R, 13/09/2008, Email from Bob Jenner regarding RAF Fighter Command 14 Group HQ (Text/Correspondence). SHG24080. <2> Historic Scotland, Information Supplementary to the Statutory List (This information has no legal significance), HB 8046 (Dataset). SHG24041. --- Image/Photograph(s)/Aerial Photograph: Drumossie Hotel. Colour Print. .
<1> Text/Correspondence: Jenner, R. 13/09/2008. Email from Bob Jenner regarding RAF Fighter Command 14 Group HQ. Yes. Digital. <2> Dataset: Historic Scotland. Information Supplementary to the Statutory List (This information has no legal significance). Digital. HB 8046.